As noted elsewhere in this guide, defining ‘Kaliningrad’ cuisine is a bit tricky. 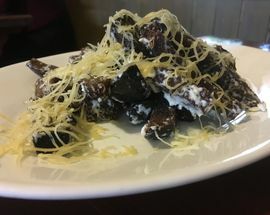 The history of the city means that ‘local’ dishes can in fact come from many different backgrounds and in fact reflect the wide mix of historical and current populations. You’ll find German or more particularly Konigsberg dishes as the ‘traditional’ dish in some restaurants while in others the dishes reflect the backgrounds of those pioneers from all over the former Soviet Union who moved to repopulate Kaliningrad in the years after WWII. 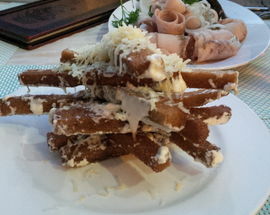 These days dishes from as far apart as Georgia, Armenia, Uzbekistan or most commonly parts of Russia itself like Siberia, might be considered typically modern-day Kaliningrad dishes. 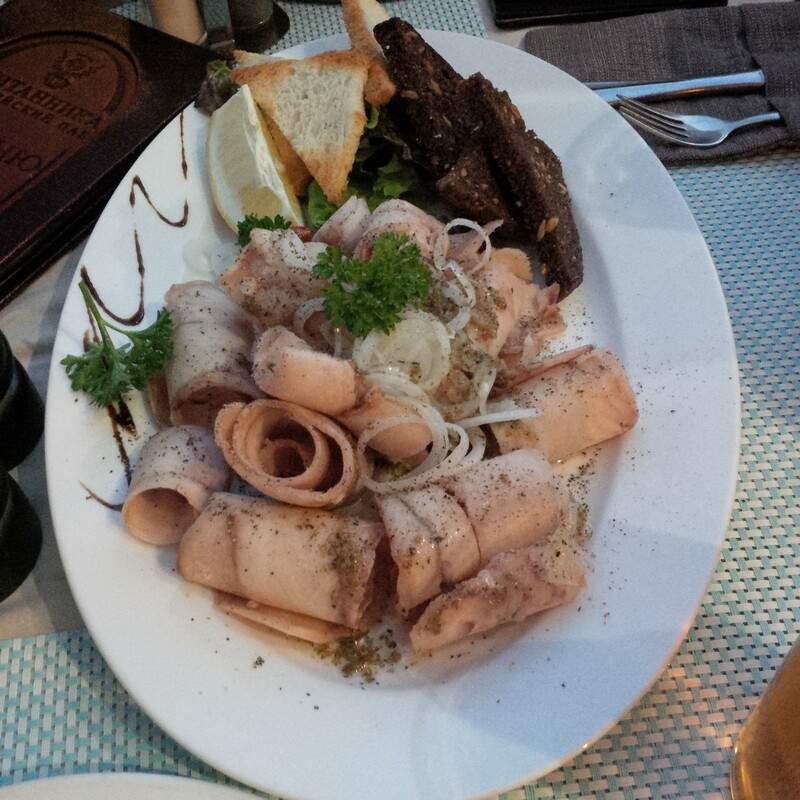 That said there are a few dishes and also drinks which we think you ought to seek out while you’re in Kaliningrad. 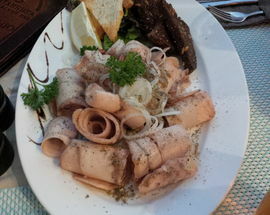 Originating from Siberia this dish consists of long, thin sliced strips of frozen fish, typically whitefish, and is served with onion, salt and pepper. The fish is cut in such a way that it forms ribbon curls and served still partly frozen. It tastes a whole lot better than it sounds and is a perfect accompaniment to a glass of chilled vodka. Try it in Britannica. 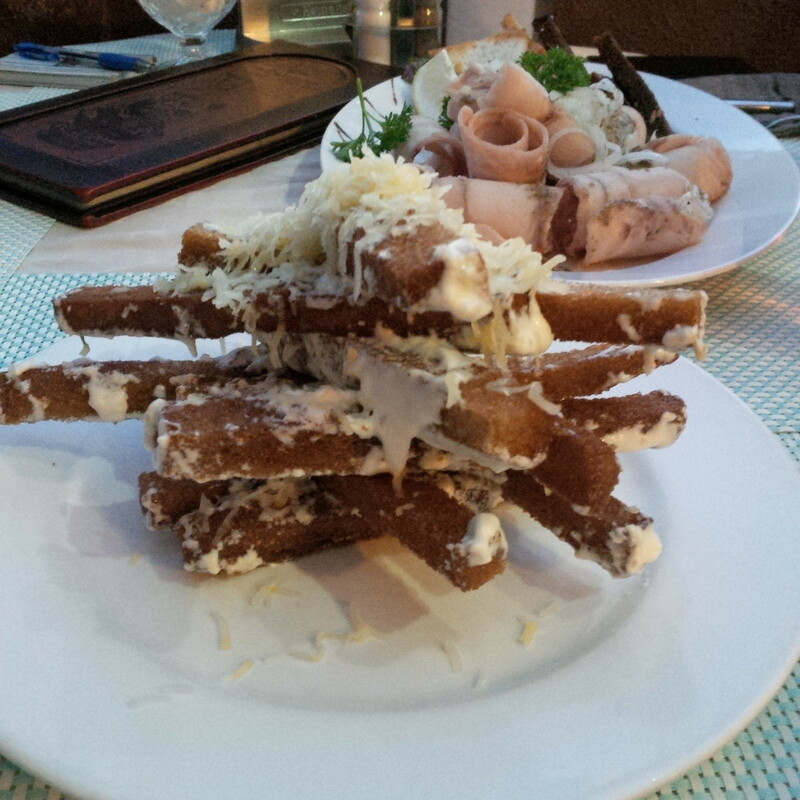 We may have spelled this incorrectly but nonetheless, if you tell the waiter this is what you want you’ll be delivered of slices of fried black bread, typically Borodinsky bread, which is covered with garlic and melted cheese. 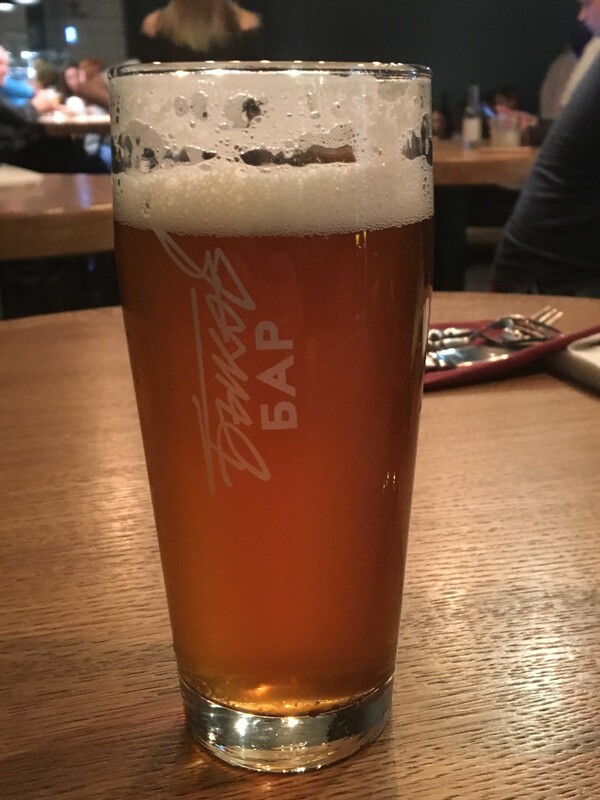 The perfect Kaliningrad beer snack. Meatballs made traditionally from finely minced veal, though sometimes that is replaced by beef or pork, which is mixed together with eggs, onions, breadcrumbs and white pepper. 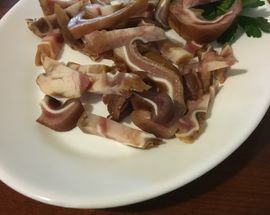 The traditional Konigsberg Klopse recipe also uses anchovy. The meatballs are simmered in salted water and the resulting broth is mixed with flour and fat to thicken it and egg yolks and capers are added. You’ll find Klopse in one of the German-themed restaurants, such as Zotler where they are served with boiled potatoes. 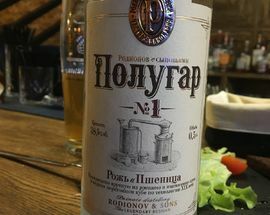 A bread-based spirit, Polugar is often described as the father of vodka and was also known as bread wine. Tsar Alexander III outlawed it in 1895 and had all the copper pot stills in Russia destroyed restricting production to government licensed distillers which led to the vodka that we are familiar with today. 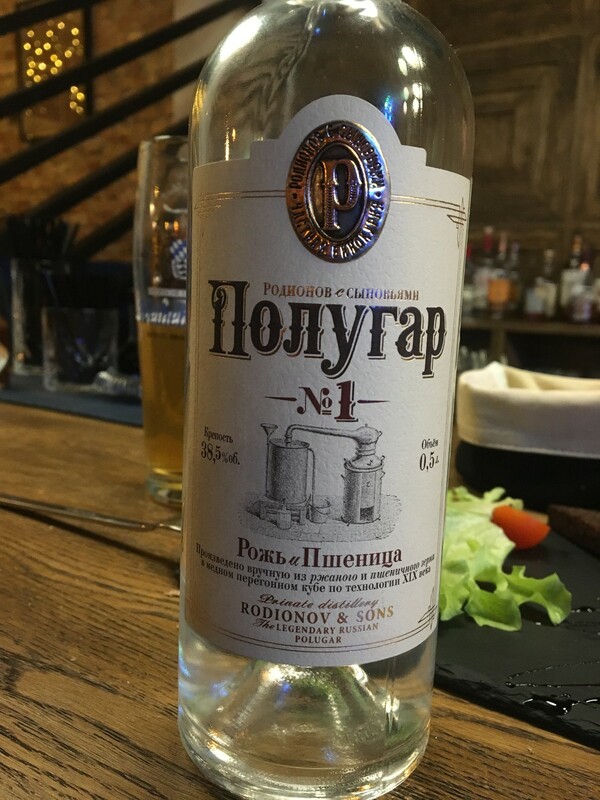 When in early part of this century the Rodionov family tried to bring the drink back they found distilling it in Russia was still blocked by legislation so instead they popped over the border and found a distiller in Poland to make it for them. You can find Polugar served in The Soul among other places. 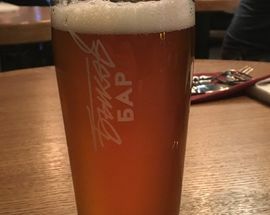 Beer is increasingly popular in Kaliningrad and the best known local breweries are Ponart, Altstadt and Safrat & Bordos. You’ll also often see the Lithuanian Svyturys as well as Polish brands. 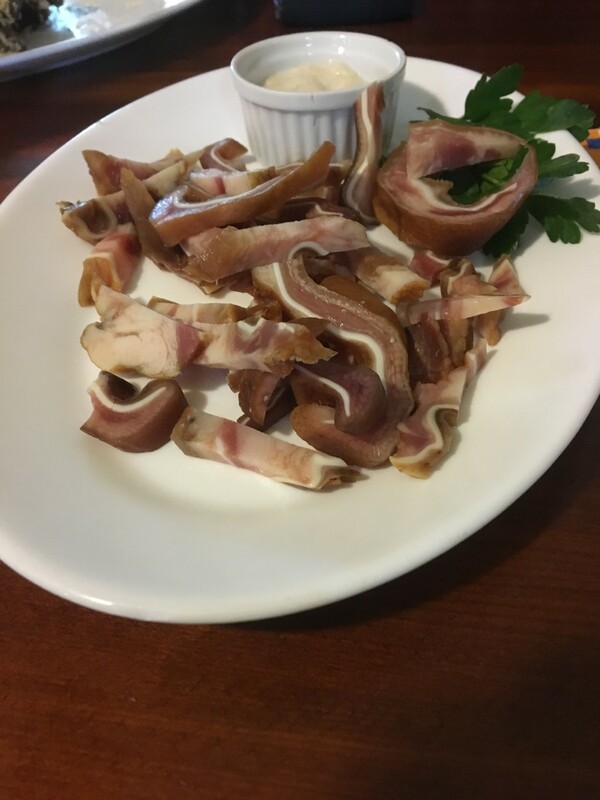 Many restaurants will also serve famous imported German and Czech beers while menus will also often contain pig’s ears and pretzels.